Scientists and engineers with expertise in soft materials develop products like inks, paints, soaps, and cosmetics. One of the main challenges in the field is to identify the interconnected properties and features that make these materials important for emerging needs and applications in product design. The Soft matter Innovation Lab is an effort aimed at facilitating the quantitative prediction of important properties for the manufacturing, fabrication and processing of commercial products, i.e., technological innovation, based on soft matter. 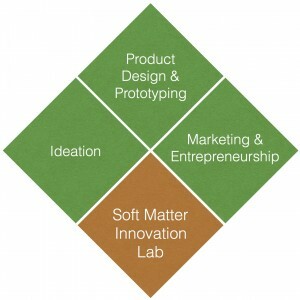 The Soft Matter Innovation Lab helps students, faculty, and companies cultivate ideas for new technologies based on soft materials, such as polymers, colloids, emulsions, and surfactants. Product specifications and usage are validated using user-centered design and consumer behavior methodologies. Ideation: Are you a competent problem solver with knowledge in complex fluids, polymers, or soft materials but lacking skills to identify a product-market fit? During the ideation process, participants find a solution to an existing problem with market potential, identified through interviews and research. This leads a pathway to innovate in new areas. Product Design & Prototyping: Once a solution to a real problem is identified, the lab provides technical support to design the product based on end-consumer needs. The expectation is to find a minimum viable product (MVP) as fast as possible, which can go to market if desired by the participants. Here, the teams are trained to formulate the MVP chemically and physically. Also, rheology and sensorial properties are considered. The process is finalized by developing prototypes and testing them in a controlled environment to ensure the consumer critical requirements are met. Marketing & Entrepreneurship: Teams interested in making startups of their products will be exposed to other programs of the UPRM E-ship Network to help them with marketing and a business model. Overall, the ideation and co-working of teams will be conducted at EPIC Makerspace at the Student Center. This space is designed to help students develop their open ideas and connected them with the innovation and entrepreneurial ecosystem at UPRM. During product design and prototyping stages, participants will mainly use the Soft Matter Synthesis and Preparation Laboratory and the Soft Matter Characterization Laboratory located in the Chemical Engineering Building. Other facilities are available however access depends on the specifics of the product. Students are also encourage to take credits as participants of Innovation Tracks (uprm.edu/itracks). They will be exposed to entrepreneurship courses. Dr. Aldo Acevedo-Rullán is Professor and Chair of the Department of Chemical Engineering of the University of Puerto Rico, Mayagüez. He obtained his BS and PhD in Chemical Engineering from UPRM in 2000 and the University of Delaware in 2006, respectively. His research focuses on identifying and understanding the molecular and particle interactions, and the thermodynamics of soft materials in order to control and design the system’s morphology and tailor its physical properties, thus allowing for the opportunity to develop novel soft materials and applications. The group combines experimental studies of the rheological and mechanical properties with thermal and structural characterization, stability, and performance studies to determine property-performance relationship. Examples include identifying the effect of insoluble drug particles in the physical gelation mechanism of biopolymers, development of magnetically-actuated liquid crystalline elastomers, and hierarchical microstructures in colloid-in-liquid crystal gels. His research group’s work has been published in the Journal of Applied Physics, Macromolecules, Soft Matter, Journal of Pharmaceutical Innovation, Carbohydrate Polymers, and Applied Materials and Interfaces, amongst others. Dr. Claribel Acevedo-Vélez is Assistant Professor of the Department of Chemical Engineering of the University of Puerto Rico, Mayagüez. She obtained her BS and PhD in Chemical Engineering from UPRM in 2006 and the University of Wisconsin-Madison in 2011, respectively. Her research interests revolve around colloids and interfacial phenomena, with a focus on the study of the interactions and assembly of surface-active materials and nanoparticles at interfaces to generate knowledge that can be useful for the design of functional materials. Prior to joining UPRM, Prof. Acevedo-Vélez worked as a research scientist and project leader within the R&D organization of The Dow Chemical Company, where she specialized in surfactant product development for multiple applications, including consumer products and crude oil recovery. She is experienced in defining, leading and executing multidisciplinary projects, in generating intellectual property and conducting intellectual property assessments, and is a certified Six Sigma Green Belt Project Leader. Dr. Ubaldo M. Córdova-Figueroa is Professor of the Department of Chemical Engineering at the University of Puerto Rico – Mayagüez (UPRM). He obtained his MS and PhD in Chemical Engineering from the California Institute of Technology. His expertise is theoretical soft matter and fluid mechanics, resulting in publications in peer-reviewed journals such as Journal of Fluid Mechanics, Soft Matter, Physical Review Letters and Nature Chemistry. His work is focused on understanding the structure and rheology of colloidal particle suspensions exposed to flows and external fields, as well as the dynamics of active particles in anisotropic fluids. He uses computational methods to elucidate physical processes in soft matter. One area of exploration in his group is the use of machine learning to discover and design new materials. In 2011 he obtained the NSF CAREER award. He serves as the Coordinator of the Research Academy for Faculty and Postdoctoral Fellows, a professional development program at UPRM designed to help early-career faculty and postdocs seeking funding for research, and recently appointed as Special Assistant to the Chancellor in areas of research, innovation and creative endeavors. He is also trained in entrepreneurship and agile strategy methods. Rheology Laboratory: One laboratory facility occupying 600 sq ft in IQ-101LM in the Chemical Engineering Building of the University of Puerto Rico at Mayagüez. Major equipment in the laboratory include: Haake CaBER capillary breakup extensional rheometer with a Haake D10 temperature bath; a TReK 610E high voltage power supply/amplifier/controller and BK 4012A 5MHz function generator, Carver benchtop manual press with heated platens, and an Anton Paar DMA4100 densitometer. Additionally, a Reologica StressTech HR stress-controlled rheometer equipped with an External Temperature Controller (ETC), convection oven, and electrorheological (ER) cell. The laboratory is also equipped with a Branson 450W and a Branson 250W ultrasonifier with multiple horn tips and enclosure, multiple Cannon-Ubbelhode capillary viscometers with refrigerated and heating circulating water bath, and Brookfield viscometers. Generic lab equipment, such as analytical balances, rotating shakers, centrifuge, hotplates, pH meters, one chemical hood, general chemistry equipment and PC computers is available. Soft Matter Characterization Laboratory. One laboratory facility occupying 363 sq ft located at IQ-01FG in the Chemical Engineering Building of the University of Puerto Rico at Mayagüez. This laboratory is outfitted with: an Anton Paar MCR302 stress-controlled rheometer, available options include convection oven (up to 450 °C) or Peltier heating systems (up to 200 °C), dynamic mechanical analysis fixture, and X-pansion Instruments SER2 extensional fixture; TA Instruments Q-2000 Differential Scanning Calorimeter (DSC); Olympus BX-51 optical microscope with reflected and transmitted polarized light attachments and digital image capture; Instec HCS302 hot and cold microscope stage with temperature controller; Westover Scientific Micromaster II optical microscope with cross-polarizers and digital camera; Amscope FM320 EPI-Fluorescence trinocular microscope with CCD fluorescence camera; Mettler Toledo Thermo-Gravimetric Analyzer/Differential Scanning Calorimeter (TGA/DSC) 1 Star System; and, an Instron ElectroPuls E3000 static and dynamic mechanical properties test system with optional environmental chamber in air to temperatures up to 350°C, a liquid nitrogen cooling unit for temperature testing down to -100°C, and a bio-bath. All major equipment has dedicated PC computers. The laboratory is also equipped with a chemical hood for sample preparation. Boltzmann Cluster: This computational facility has 324 processors available for computations submitted through a batch queue. It includes a head node (Intel dual core duo Xeon 2.00 GHz processors with 16 GB RAM and 3.5 TB HDD), five Sandy Bridge nodes (Intel Xeon 2.00GHZ and 32GB RAM), four compute nodes (Intel dual core duo Xeon 2.00 GHz processors with 2-4 GB RAM and 80 GB HDD) with nine compute nodes (Intel quad core quad Xeon 2.40 GHz processors with 6 GB RAM and 80-160 GB HDD) and sixteen compute nodes (Intel quad core duo Xeon 2.00-2.83 GHz 2-16GB RAM and 80-1000GB HDD). The cluster is protected by full battery backup. The PI has also access to a network of computers using HTCondor, a specialized workload management system for compute-intensive jobs. Like other full-featured batch systems, HTCondor provides a job queueing mechanism, scheduling policy, priority scheme, resource monitoring, and resource management. UPRM Instance consist of a head node with 2 x Intel(R) Xeon(R) CPU E3120 @ 3.16GHz, 8GB of RAM and 320GB HDD. This head node is able to communicate with various desktop computer nodes across campus that uses Ubuntu or Microsoft Windows as operating systems. Product formulation developed by the lab staff: IP is owned by UPR. Product formulation from a team of students: Students own the IP. Product formulation from team of student and UPR employees (professors): IP is typically owned by UPR. Product formulation and idea from a research collaborative agreement between a company and UPR: IP is shared. Licensing agreement and other negotiations can occur depending on the circumstances. Complete the following form if interested in transforming your ideas into real products or to obtain services from the Soft Matter Innovation Lab.